Grimlock is a tragic figure. 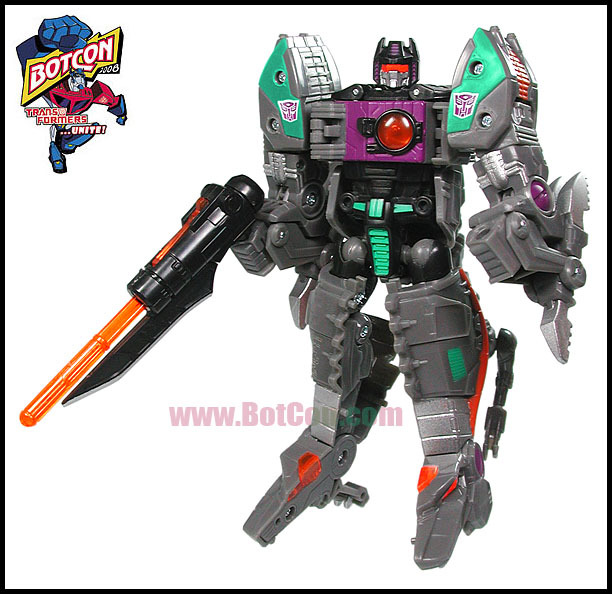 He was originally developed by the Decepticons as a soldier whose sentience would be based on artificial intelligence rather than a Ember. However, his violent subroutines overrode his logic programming causing him to destroy the facility that created him. Megatron was able to deactivate him and he was stored away, never to be used again. However, when Optimus Prime learned of this creation, he stole Grimlock and reactivated him. Offered a chance to revel in his violent tendencies, Grimlock eagerly joined Optimus Prime and serves as his most potent warrior. 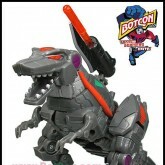 Grimlock will not stop tearing through the enemy ranks until they are all destroyed or he can no longer move. He simply cannot feel mercy and has little self control. "I wish I had a thousand more like him!" says Autobot leader Optimus Prime. Fortunately for the Decepticons, he doesn't. On April 1st, 2008, Fun Publications uploaded a fake April Fool's Day version of the first three pages of Timelines: Shattered Glass. In this spoof comic, Grimlock spoke with an intellectual, upper class accent ("I, Grimlock, am scandalized, wot?"). 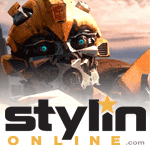 This proved so popular with the fandom that Fun Publications intends to integrate this element into later fiction that focuses on the Shattered Glass universe, such as the Dungeons and Dinobots text story. 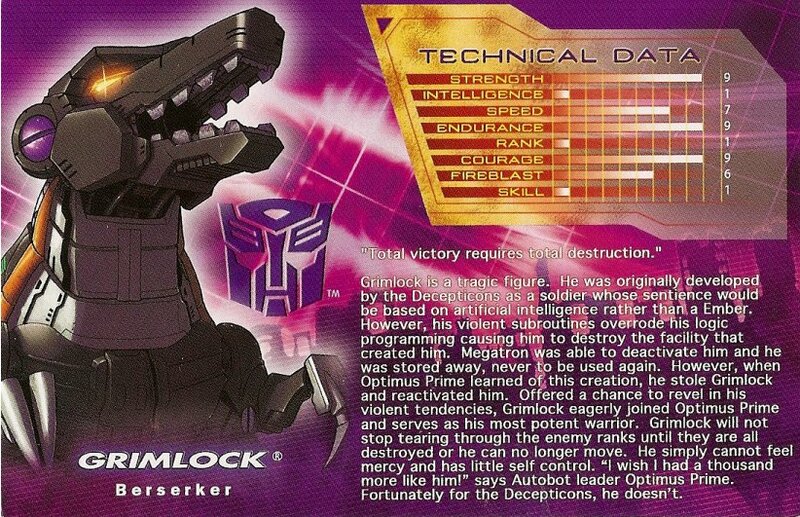 True to his tech specs, Grimlock is a raging beast unleashed by Optimus Prime when he wants something definitively dead during battle. During the attack on Optimus Prime's warship, the Ark, though, Grimlock found himself fighting all three of the Predacons and having some trouble with the three small Decepticons. 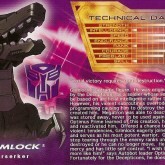 A teaser panel has also been shown for a text story at Botcon 2008, titled Dungeons and Dinobots. 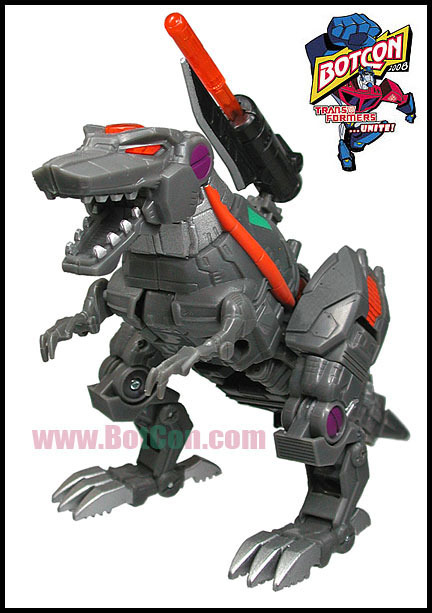 It features a more intelligent Grimlock who speaks with his English accent from the Fun Publications April Fool's Day gag.